Add a favorite photo of you and your special someone and turn it into a wonderful keepsake you can enjoy every day. This I Love You Photo Dog Tag Set lets you upload any photo that you choose on one dog tag and then say who you love the most on the other! Perfect for Valentine's Day or any romantic gift giving occasion. Your Romantic Photo Dog Tags comes with two metal dog tags, each measuring 1.125" x 2"on a 30" Beaded Necklace. Includes FREE Personalization! Upload your favorite custom photo below. 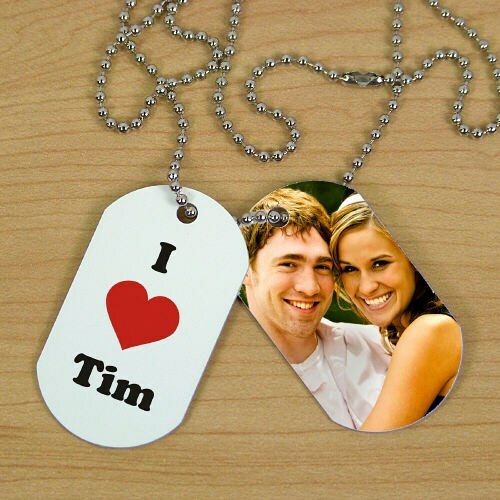 We can only accept digital photos for the Personalized Love Photo Dog Tags. We personalize the message tag with any name. Recommended pixel resolution (dpi) is at least 300 x 300. Additional Details 800Bear.com has provided you with a romantic collection of Personalized Valentine's Day Gifts to make this day extra special. Shop our collection today and find wonderful keepsakes, plush animals and even apparel for the one you love most.